In recent times we have received a number of regular enquiries via the PM support Service relating to serving notices and what is considered ‘the norm’ as far as delivery times and what is considered appropriate. We have also received feedback from property managers regarding this issue and the outcome of some QCAT hearings. In some cases the notices issued by the agent were rendered invalid as it was deemed insufficient notice had been given to the tenant based on the required postage time. It appears the recent changes to postal delivery timeframes by Australia Post are impacting on the situation. There is a common misperception in our profession that you allow 2 days for postage in addition to the required minimum notice period, no matter what part of Queensland you are sending the document to. This timeframe is onerous, it is not legislated and should not be relied on. It is recommended you use the guide from Australia Post for delivery timeframes if you intend on posting notices with minimum timeframes to tenants. 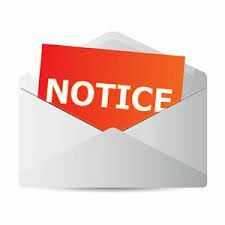 Where notices are served by post, the sender must allow time for the mail to arrive when counting the days and working out the date for the notice period to end. This means that the first day counted in the notice period is the day after the notice arrives at the address. We did the exercise of sending a notice on 15 September 2015 from an inner city suburb of Brisbane to another inner city Brisbane suburb. The Australia Post website indicated the delivery of the document could be anywhere from 15 September 2015 to 21 September 2015 (taking into consideration the days that Australia Post operates). Published QCAT decisions should be reviewed regularly to provide guidance on how the Tribunal may view a particular matter. It is a timely reminder for property managers that if delivery time is not sufficient, this could impact on the ‘notice period’ and put a property manager in a position that they haven’t allowed the tenant the minimum required time to remedy a breach as an example. Property managers also need to be aware of what the tenants have agreed to on the Form 18a in relation to the address for service of notices and how the notices may be given. Pay particular attention to what is noted in Items 2 and 4 of the General Tenancy Agreement (Form 18a). Both of these sections provide provision for the tenant to nominate how they would like to be served any notices, whether it be by an alternate postal address or their preference of emails or facsimiles (electronic transactions). If an email address for the party or agent is stated in this agreement for item 1, 2 or 3 and item 4 indicates that a notice may be given by email – by sending it electronically to the email address in accordance with the Electronic Transactions (Queensland) Act 2001.Given that Australia Post provide a fairly broad timeframe on when documents will arrive at their destination, more and more agencies are looking for more cost effective and time efficient ways to deliver notices, namely via email. When serving notices electronically, the server does not count the day of service in the notice period. The first day of the notice period should be the day after the notice is served. Evidence of a delivery receipt. Make sure the ‘delivery’ and ‘read’ function is activated on your emails. Evidence of SMS communication to the tenant to confirm you have sent a notice via email (if you have consent to communicate this way). Throughout the tenancy, what has been the average time for that particular tenant to read or respond to an email you have sent to them. If a particular tenant has a demonstrated history of not accessing emails on a daily basis best practice would be to err on the side of caution and factor in additional delivery time when calculating the minimum notice period.